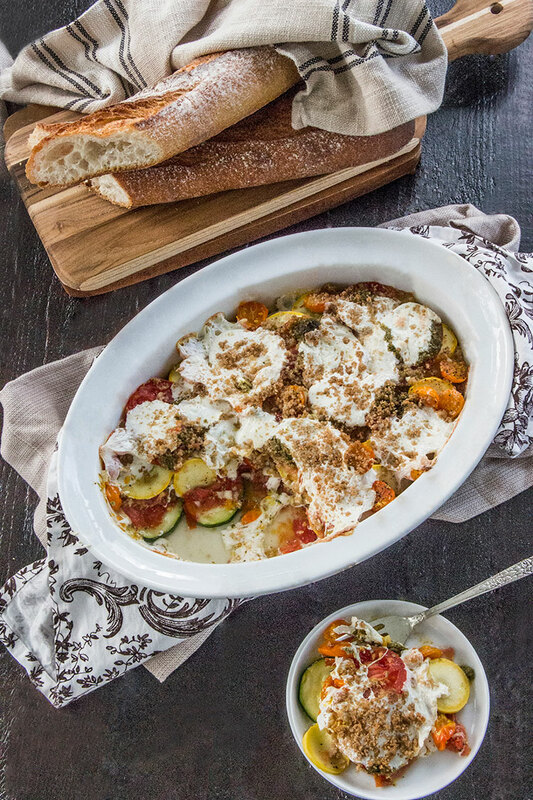 As the Northeast continues to get blanketed with one wintry blizzard after the next, I’ve become quite the expert at coming up with hot, oven baked dishes. Buried under six feet of snow, there is not much else to do but cook and not much else to crave but warm comfort food. The silver lining is that I came up with these vegetarian Greek stuffed peppers, which are delicious and really, really flavorful. 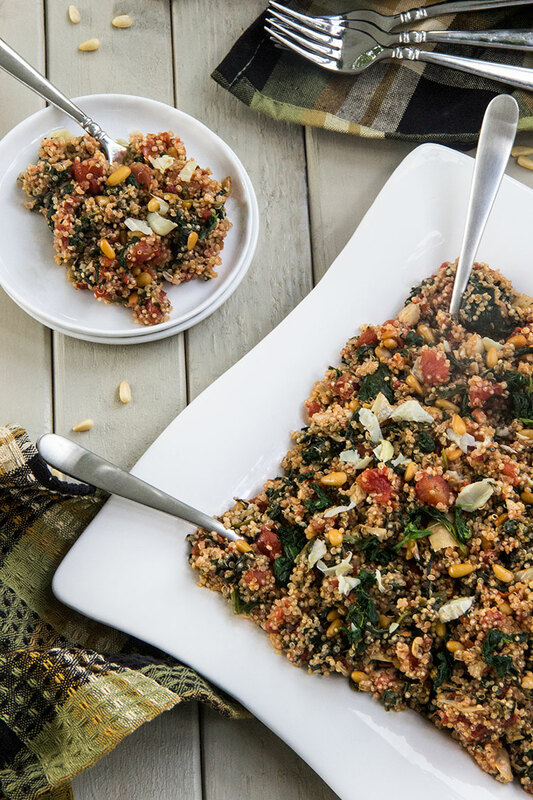 All of the flavor comes from the combo of tasty Greek-inspired ingredients: chopped tomatoes, spinach, dried oregano, crunchy pine nuts and plenty of crumbled feta cheese! 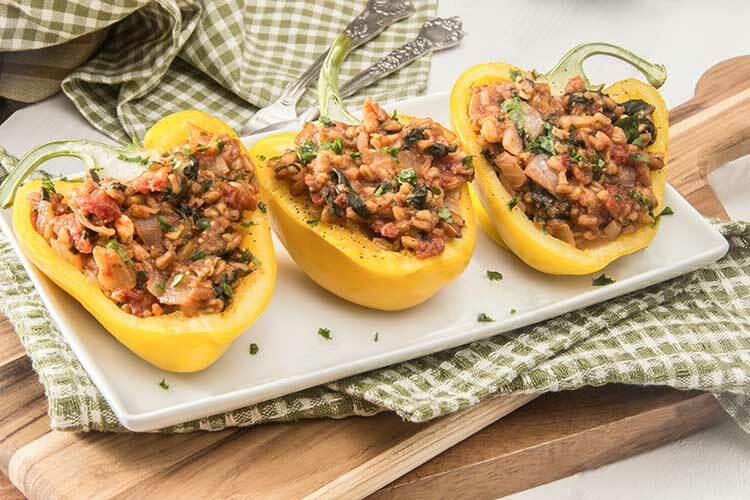 The farro mixture is deliciously flavored with the chopped tomatoes and oregano. 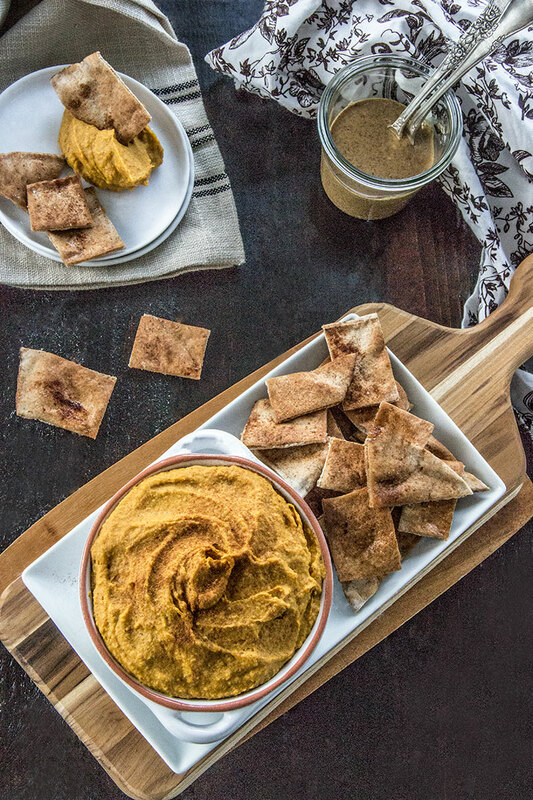 The toasted pine nuts add a yummy crunch. And the feta adds so much savory richness. 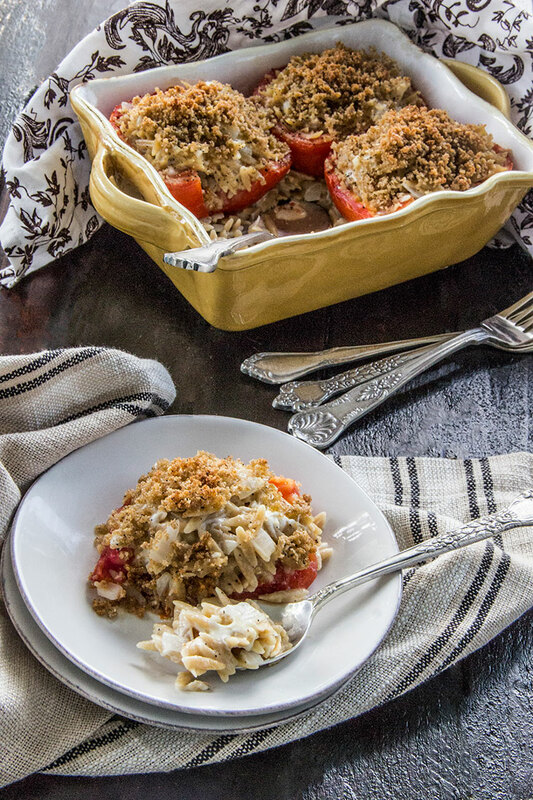 These Greek stuffed peppers are healthy, hot-from-the-oven comfort food! It’s nice to know I can at least feel healthy about eating all of this richly flavored comfort food. Heat 2 tablespoons olive oil in a large, deep sauté pan over medium heat. Add the garlic and onion and cook until softened, about 4-5 minutes. Add the tomatoes, broth, oregano, and farro. Bring to a boil, then reduce heat to a light simmer. Cook, partially covered, until farro is tender, about 30 minutes. Meanwhile, as farro cooks, arrange pine nuts on a parchment-lined baking sheet and toast in the oven for about 5-7 minutes, or until lightly golden. Watch carefully - they burn quickly! Set toasted pine nuts aside. Increase oven heat to 400 degrees F.
Arrange pepper halves on a baking sheet and brush with 1 tablespoon olive oil. Season with salt and pepper. Bake in the oven until tender, about 20-25 minutes. Meanwhile, measure out 1½ heaping cups of frozen chopped spinach, and place the frozen spinach in a heat-safe container. Microwave until thawed. When cool enough to handle, transfer thawed spinach to a fine mesh strainer. Arrange the strainer over a large mixing bowl and squeeze spinach, wringing dry, until all excess water is drained from the spinach. When farro is fully cooked and tender and all of the broth is absorbed, add the toasted pine nuts and chopped spinach. Add feta and stir until well combined. Season to taste with salt and pepper. Stuff cooked bell pepper halves with heaping spoonfuls of farro mixture. Serve. Wonderful. I love this kind of recipe because you can change up the ingredients, and also turn them into cuisine you like, from Greek to Mexican. Love! 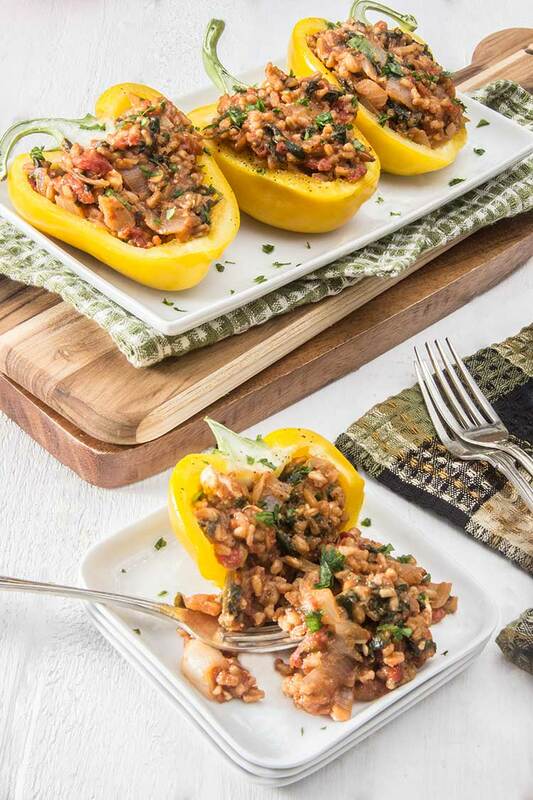 Wow, I love stuffed peppers and these look beautiful!